When Dian Fossey established Karisoke Research Center in 1967, there were approximately 240 mountain gorillas left and it was assumed they'd be extinct by the end of the century. Today there are just over 1000, 600 in the Virungas and the rest in the Bwindi Impenetrable Forest in Uganda. Although they're still critically endangered, it's a rare conservation success story, and one in which tourism has played a positive role. Visiting the gorillas is tightly regulated. There are 10 families in the Virungas that are habituated to humans, but there are usually 56 permits issued each day, 8 per group, so not every family is visited every day. The visits last one hour. 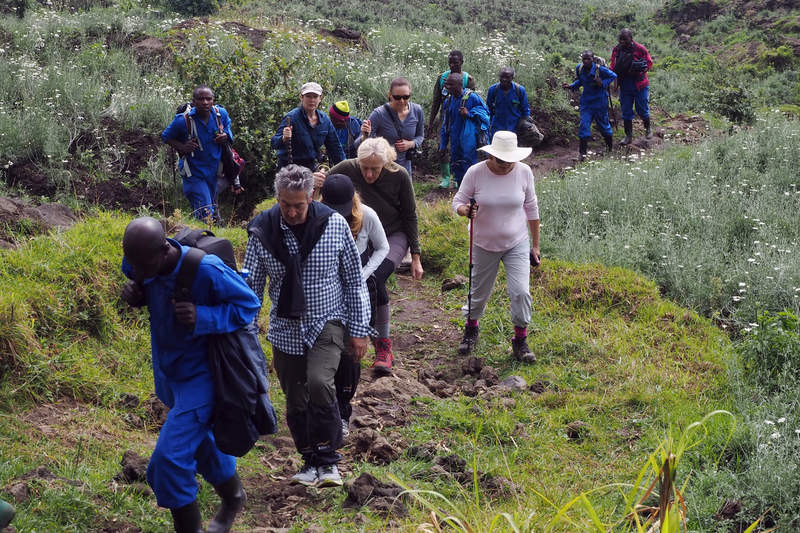 We had two prep sessions before we went, one the night before with the head of Rwanda tourism, and one with our guide Augustin before the trek. We learned to make the vocalizations that mean we're not a threat and how to show submission if a silverback took offense at our presence. I got better at the vocalizations -- my first attempt received the gentle rebuke, “It's not a cough,” but by the next morning I got a “Very good“ -- but it's a rumble so deep in the throat that it's hard to do for more than a minute or so, and for me at least usually ends in coughing even if it sounds all right before that. Rwanda raised the price of permits last year, from $750 to $1500. A certain percentage of the money goes to local communities, but it's given in the form of improvements like schools, roads, and electricity instead of cash payments. Some of it benefits the entire country; Rwanda now has universal health care and free public education. And some of it is earmarked for expanding Volcanoes National Park, and creating more of a buffer zone between humans and the gorillas. There are farmers inside the current park; the first part of the trek is through their fields.